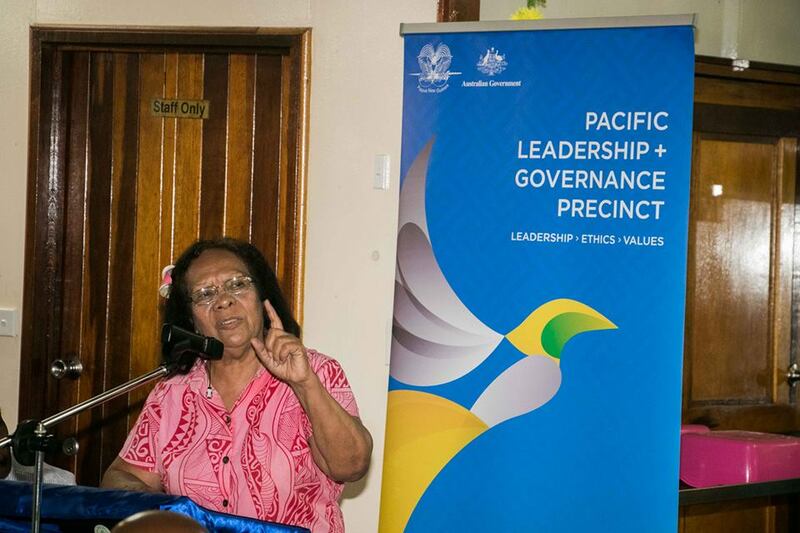 Regional public servants and the Board of the Pacific Leadership and Governance Precinct came together in Madang recently to exchange insights and ideas about public sector leadership and delivery of services in subnational areas. More than 45 participants at the Pacific Institute of Leadership and Governance’s project management short course took hold of a unique mentoring opportunity with the Precinct’s eminent Executive Advisory Board, which included Archbishop Douglas Young, John Kali, Fr Jan Czuba, Bruce Davis, Dame Meg Taylor, Tony Shepherd, Jean Kekedo and Serena Sasingian. Course participant Angella Wauwau, community development officer in the Nuku District of West Sepik Province, said public servants were being trained to ensure local communities are empowered to respond to local issues and opportunities. “We officers at the district and LLG level experience firsthand the challenges, problems, needs and aspirations of our people,” Ms Wauwau said. “We need to be equipped with knowledge and skills – refresher courses and short courses empower us and motivate us. Project Management was the first Pacific Institute of Leadership and Governance short course to be run in Madang with Precinct support, which is increasingly focused on providing opportunities for subnational public servants. Douglas Kilipi, DDA Executive Officer & Project Manager in the Mul-Baiyer District of Western Highlands Province, said public servants in regional areas each have a crucial role to play in national development. Course participants came from the provinces of Western Highlands, West Sepik, Oro; the Madang Districts of Middle Ramu, Bogia, Sumkar, Rai Coast, Unsino-Bundi and various branches at the Provincial Headquarters. The Pacific Leadership and Governance Precinct is a partnership between Papua New Guinea and Australia to support the development of ethical, capable public sector leaders in Papua New Guinea.